This weekly email sent to all students is meant to communicate important dates/deadlines, ways to get involved, and reminders about services on campus. The intended audience is currently enrolled Roosevelt students, so messages should be relevant to this population. All submissions must come from a valid Roosevelt email address. Solicitation will not be accepted, and the Office of Student Services reserves the right to modify the post and/or choose not to post a submission. All submissions are due by 4:00pm on Friday to make it into the Monday mailing. Only the first 150 characters of your announcement will appear in the email. Student will be able to follow a link to read the full announcement. Do your best to keep your announcement concise! You can use basic styling in your announcement (bold, italic, etc.) but these will only be visible in the linked full announcement. Keep your styling simple when you can! This form is for announcements only. Events are automatically pulled in from the Student Activities section of the University Calendar. 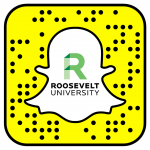 Please contact your department’s LiveWhale manager or webmaster@roosevelt.edu to get your event on the University Calendar. Nothing should be submitted in ALL CAPS. Titles before names are capitalized (ie. President Ali Malekzadeh), but not capitalized after names (Ali Malekzadeh, president).